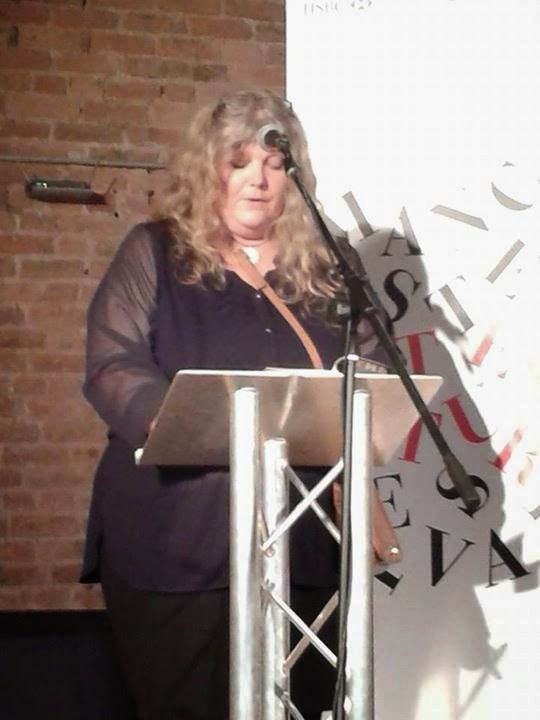 On Monday I went up to Manchester to both visit Sarah of Crime Pieces (and a Petrona Award judge) and to go with her to a Nordic Noir event hosted by the Manchester Literature Festival. The event, Danish Crime, featured Peter Guttridge interviewing Elsebeth Egholm and Lene Kaaberbol. Elsebeth Egholm is the author of the Dicte Svendsen series and the Peter Boutrup series (more about the relationship between these in a moment). Only one of the Dicte Svendsen series has been translated into English - the fourth, Next of Kin - and this was only published in Australia. Both of the Peter Boutrop series are or soon will be available in English in the UK. Lene Kaaberbol, co-writing with Agnete Friis, is the author of four Nina Borg novels (only three are available in English at the moment). Nina Borg is a Red Cross nurse, living in Copenhagen. 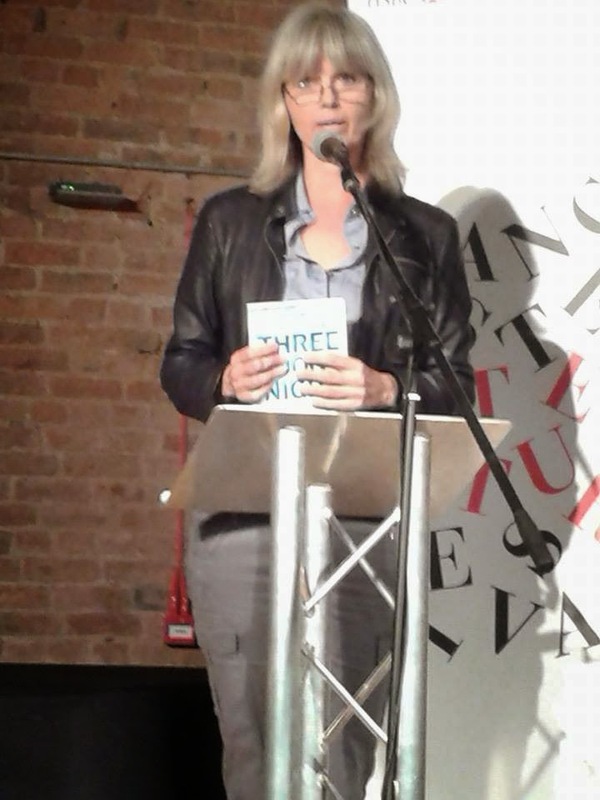 Elsebeth Egholm read a section from Three Dog Night, the first of the Peter Boutrop series, where Peter discovers a body. Before reading she gave some of the background to the series: Peter is the son of her series heroine Dicte Svendsen. Dicte is a Jehovah's Witness and got pregnant aged sixteen. Her baby, Peter, ended up in an orphanage and had a terrible upbringing and ended up in jail. Peter doesn't forgive his mum and only meets Dicte in book five of her series when he needs a new kidney. The title Three Dog Night comes from an Australian saying which refers to a very cold night when you need three dogs to keep you warm! Lene Kaaberbol then read the scene from The Boy in the Suitcase (the first in the Nina Borg series) where Nina discovers the boy, in the suitcase at Copenhagen station. Then Peter began his interview. EE's first book was published in 1999 and her first three books weren't really crime but did contain mysteries. She then embraced crime with the Dicte Svendsen series. Dicte is a journalist, as is EE, however EE is not a crime journalist so this involved lots of research. LK has written children's and YA books but the scene she's just read out popped into her mind. An avid crime reader she got 'stage fright' over the idea of writing a crime novel so called an acquaintance Agnete Friis. They have a 'bible' and storyboard the series. They felt that there were lots of police characters, both male and female, as protagonists so they though who else would discover bodies - doctors and nurses - so they settled on a tough nurse. Nina is a terrible detective however, say LK, as she doesn't care who killed who! EE originally thought the Dicte series would be a trilogy. There are currently six with two more planned. She commented on how you can't undo something like a pregnancy which was in the first book. How do you tell an extrovert Finn? He's looking down at your shoes, not his own. EE said she was inspired/influenced by Sara Paretsky and Liza Marklund, (comment from LK - "volvo envy" - as Swedes get everything first) and LK was also inspired/influenced by Sara Paretsky, Agatha Christie and Sjowall and Wahloo. Sjowall and Wahloo wanted people to move over to socialism and decided the best way to influence people was via a crime series. The political element increases through the [Martin Beck] series. The Dicte Svendsen series has been made into a tv series with the first six books making up the first series. The second series is based on original stories. EE chose not to get involved with the scripts - based on her experience with Those Who Kill - it is very time consuming. One of LK's children's books is being made into a film - she is not involved as she has an Oscar winner doing the script. LK said that she didn't consider children's books as lesser to adult as though an adult can get a few days entertainment from your book, a child can be influenced for life by your book. It is most rewarding when someone hasn't read a book before and says that I've read one of yours and then went on to read all of them. Sarah asked the question about reading from an English translation of your own books: EE said it puts a slight distance but she loves the English language and thinks it sounds better in English :). LK said she had a close relationship with her translator for Boy, as it was herself! Sounds like a great event, Karen. Glad you were able to be there for it. Thanks for the summing-up.